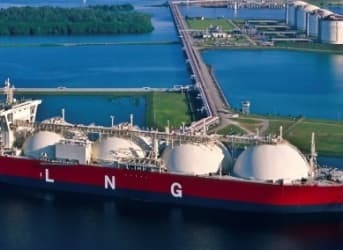 The first export shipment of U.S. LNG left the brand new Sabine Pass terminal in Louisiana at the end of February. And while operator Cheniere Energy should be proud of its accomplishment, LNG exports are unlikely to change the game for U.S. gas producers as a whole, as many would have hoped. Cheniere has been working on this project for years, and was the first company to get an export license for LNG. Liquefaction terminals are now seen as the new hope for gas producers in shale, and even more optimistically, as an opportunity for the U.S. to find its place among the largest exporters of LNG, where the top two spots are currently held by Qatar and Australia. On the one hand, U.S. LNG exports could relieve Europe of its overwhelming dependence on Russian gas, meanwhile relieving the U.S. itself of the gas glut it has been suffering. This, however, is only a hypothetical possibility, because transporting LNG to a suitable delivery point, which means a special LNG facility, costs money. The market situation is not too attractive in Asia, either, the other major potential destination for U.S. LNG. Demand is lagging behind supply on a global scale and in Asia in particular. This follows the spike in prices after the Fukushima disaster in 2011, when Japan shut down a lot of nuclear power generation capacity. This capacity, however, is starting to come back online, and regional demand for gas is dwindling. Optimists, such as Platts and the Wall Street Journal, believe that sooner or later (probably later) the U.S. will become a force to reckon with on the global natural gas export scene. The “later” part, however, should worry industry players because it means not all of them will survive, and those that do will have to pour possibly tens of billions of dollars into building liquefaction capacity. Related: Oil Fundamentals Could Cause Oil Prices To Fall, Fast. In other words, the U.S., in its new role of a natural gas exporter, will face very stiff competition. This competition will keep prices low for a prolonged period, so only the most resilient gas producers will survive, and eventually start to turn in a profit. As for the glut that is gripping the domestic U.S. market, its end is nowhere in sight for now—exports or no exports. LNG is particularly vulnerable to price competition from wind, solar and batteries. Née solar may cost as little as $40/MWh within an LNG import market. A CCNG plant needs 8 MMBtu/MWh. Thus, LNG must compete with solar at $5/MMBtu = $40/MWh ÷ 8 MMBtu/MWh. Howerver, it costs an LNG producer about $5/MMBtu just to liquefy and ship to Asia. This is a breakeven proposition in quantity only is the price of natural gas $0/MMBtu or less. Thus, LNG cannot support the price of natural gas in the US at any sustainable price. Solar, wind and batteries will continue to get cheaper and achieve scale in LNG import markets. So the cost of liquefying and transporting must come down dramatically, about 15% per year, just to stay in the market. This may happen if producers and shippers write down assets and possibly go bankrupt. The value of an LNG train or tanker will be next to nothing when LNG is priced out of import markets. Shareholders in these companies will need to absorb these capital losses. I believe the longterm opportunity for natural gas is as a petrochemical feedstock. If we have an abundance in this country, let's turn that into plasticizers and other high value chemicals. Could you detail how much and path of lead precursors of a fraked shale gas well from ground source to release to atmosphere? Radon turns into radioactive lead. Radon will be in the frack gas that will be burned in the Sabine Pass terminal in Louisiana . the question is, what is the mass of radioactive lead, radon and residual uranium daughter elements in that frack gas. in the LNG chilling process, when the propane and radon condense out, where is that stream directed? In some plants it gets eventually burnt in elect plant. What is the Pci/L of that gas? How is radioactive black powder handled in pipeline pigging process, disposal of contaminated pipe/valves? What is plant Pb mitigation plan? lead content of proposed Jordan Cove plant In Coos Bay Oregon from radon approximately 2,200 pounds a year to as high as 15 tons. 1. LNG Exports only just began (as you pointed out Chenerie has only filled 1 single export vessel) - so of course that will have practically no impact on price, it's a drop in the bucket compared to the size of the NG market. They only have the capacity to export about 3.5 Bcf per month - again small compared to the size of the market. More LNG export capacity is coming online, between 10-20 Bcf/month by 2018-2020, so it may start impacting the market then. 2. FYI - the US is a net exporter of NG as of January 2015 - EIA data is always out of date. 4. The shale revolution is not a US only phenomenon. It's happening world-wide where there are shale formations - so the price of NG world-wide has dropped due to increased shale NG production.